The photos in the designs section are there mainly as starting points. Today I want to show you how Allison took a feature of a bracelet design she found on my website and added it to her existing chain to create her own design. Allison liked the engrave discs of my Memeory Bracelet. However she wanted a necklace and thought using an existing chain of hers might help her meet her budget. Usually I would create a digital mockup of the design but in this case I did not need to. I took Allison`s chain and fitted a silver sample of the engraved discs I had to it so that she was able to try it on. With the design and quote approved we set about finalising the layout for the engraving of her children`s names. 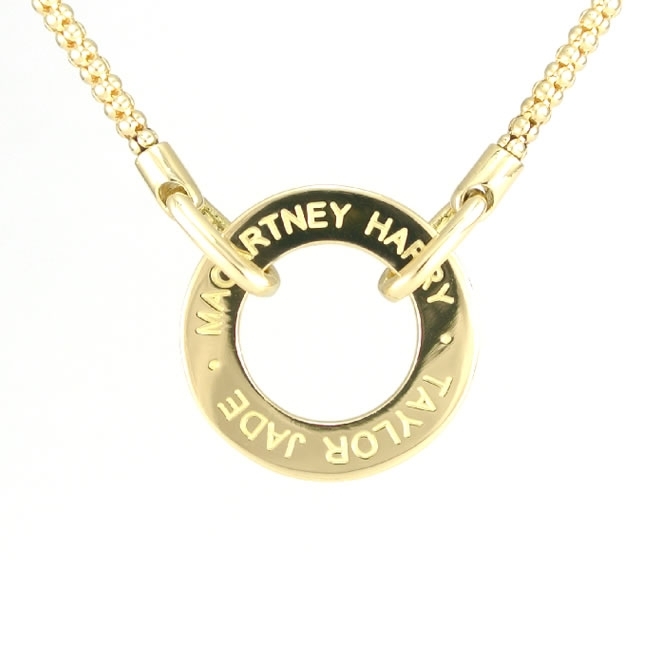 As you can see from the photos below Allison had the disc made in 18ct yellow gold to match her existing chain. She also decided to leave the engraving its natural gold colour.